Looking across all Johnson & Johnson’s business practices, the Company shares important disclosures about how it supports good health for patients, consumers, employees and local communities on a global scale. The report tracks how Johnson & Johnson is striving to eradicate and prevent disease, reimagine how care is delivered, and put a healthy mind, body and environment within reach of all people around the world. Announced the U.S. FDA approval for JULUCA®(dolutegravir and rilpivirine) in November. Developed in collaboration with ViiV Healthcare, JULUCA® is the first and only complete, single-pill, two-drug regimen to treat HIV-1 infection. Introduced a new global standard for Parental Leave, where employees across the globe - including countries like Brazil, China, India and Japan - are eligible to take a minimum of eight weeks paid parental leave for birth or adoption. To watch a short video-summary of achievements in 2017, click here. At Johnson & Johnson, we believe good health is the foundation of vibrant lives, thriving communities, and forward progress. That’s why for more than 130 years, we have aimed to keep people well at every age and every stage of life. 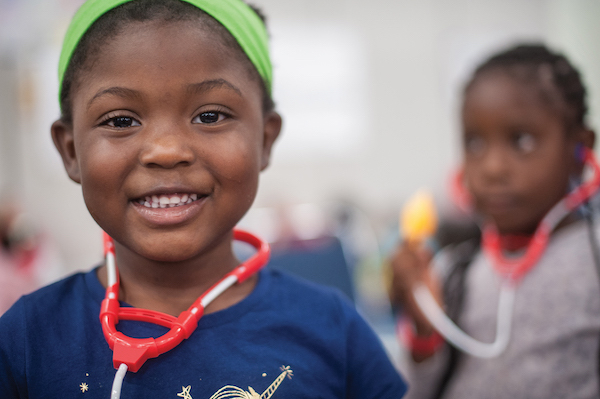 Today, as the world’s largest and most broadly-based health care company, we are committed to using our reach and size for good. We strive to improve access and affordability, create healthier communities, and put a healthy mind, body and environment within reach of everyone, everywhere. We are blending our heart, science and ingenuity to profoundly change the trajectory of health for humanity. Assured by third-party, ERM Certification and Verification Services Inc.; figures are cumulative for 2016-2017 and have been rounded.